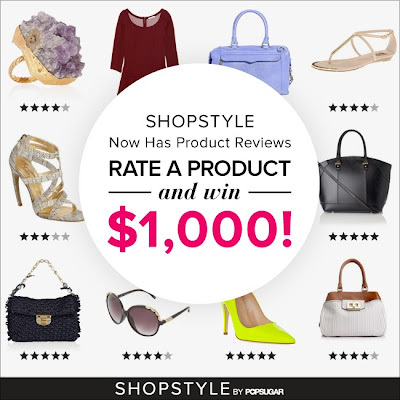 Just wanted to write a quick post and let you know that ShopStyle.com now has a new product review feature. You can rate a popular or new product, or search for a certain product. Anything you have already tried, you can rate and review. The feature is easy to use and only takes a few minutes. If you do decide to rate, you will be entered to win a $1,000 Visa gift card! You need to sign in to ShopStyle, search products, and write what you think. Make sure you review before Sept. 26, and you get one entry for each review. So easy! You never know, you could be the big winner! New Pantene Smooth Collection - Giveaway!